Hashtag #lasttweet began to appear in Twitter frequently after government troops engaged the final phase of Aleppo’s liberation in recent weeks. Bana al-Abed, an alleged seven-year old resident of the largest city in Syria, was the first who created an Internet hysterical fit designed to discredit the process of recapturing Aleppo. Her Twitter account was registered in September, 2016, amid intensified fighting in Aleppo. There are many details of the horrors of war on her page. And the girl blames not the terrorists but the Syrian government and its allies. Tweets are actively retweeted and not only by the Syrian opposition, but also by the mainstream Western media. For example, The Washington Post called Bana the Syrian Anne Frank(who wrote a diary in Nazi-occupied Netherlands). At the same time, no one draws attention to the strange nuances. First, tweets appear very often. It seems that the little girl posts the information about the situation in the city 24/7. Aleppo is a city of constant fighting, with no constant energy source and water supply, and there is often lack of food and medicine. The more so, no one can easily access the Internet and cellular network due to damaged infrastructure. Second, her account looks perfect in terms of English language. Third, celebs, Western journalists and popular opposition bloggers contribute to the viral dissemination of Bana’s posts. It took just three hours to collect more than 3,700 likes and more than 5,000 retweets after the publication of one of the first tweets of Bana. 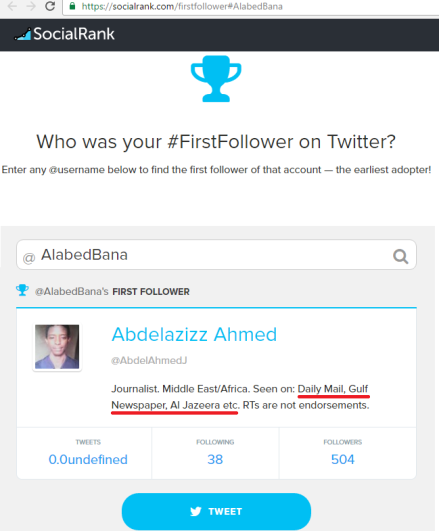 According to Social Rank website, the request “Who was your first follower?” shows the first subscriber of Bana was an Al-Jazeera journalist Abdul Aziz Ahmed. Moreover, J.K. Rowling promised to send the girl a Harry Potter book and by doing so the writer made a very good ad and emphasized the problem of Bana. Despite the fact that Syria has always been at a high level of literacy of the population (more than 90 percent in fact), Aleppo has been involved in the civil war for four years. At the same time we are forced to believe that the seven-year-old child has such a good command of a foreign language that she is ready to read a book of several hundred pages in the original language. Speaking of the language it should be noted that a Syrian activist Maytham Al Ashkar who is originally from Al-Zahraa in northern Syria, currently in Beirut, but often travelling to Damascus and Aleppo contacted the 7-year-old Twitter star, Bana Alabed, on November 27, offering to evacuate her family from eastern Aleppo. After a month, someone who identified herself as Bana’s mother responded. When he got contacted by Bana’s account, he started to chat in Arabic since they are all Syrians and Arabic is their mother tongue. However, it was obvious that the person behind the account preferred English as a language of communication. The girl and her mother didn’t arrange the possibility of evacuation which could be provided by the journalist. So, Maytham Al Ashkar decided that the girl is just a face, a tool used by the British intelligence (British – because of the strong relationship between the Bana’s account and the White Helmets funded and sponsored by the UK). It should be noted that not only Bana writes these tweets but also her mother Fatima al-Abed who is a teacher at a local school. It is she who helps her daughter to write so grammatically right. Nevertheless, all this raises a number of questions: who and where from is really writing on behalf of Bana? There are a number of other controversial issues. Inside Syria Media Center will try to investigate the Bana project. 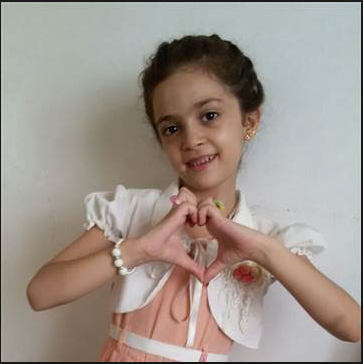 On November 27, Bana reported that her home had been destroyed after the shelling. 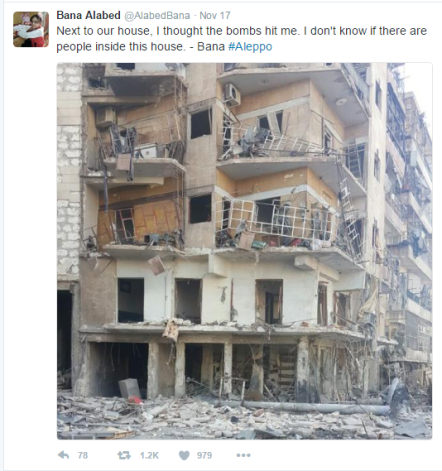 The house is allegedly located in Joured Awaad quarter in the eastern part of Aleppo. Meanwhile, about 20 shellings performed by the anti-government forces were registered in the provinces of Aleppo on November 26. The armed groups of the fired multiple launch rocket systems against Bayada and Salah al-Din quarters of the Aleppo city. In addition, terrorists of Jabhat Fateh al-Sham and ISIS several times fired multiple launch rocket systems, tube artillery, mortars and small arms against Shurfa inhabited area, Binyamin, Dahiya al-Assad, Jamaiyah Fahat, Amri, Ashrafiyah, Art Sabah, Akyul, 1070, Hai Zahraa Awwad, Kastello trade center, al-Assad military academy, area of the former military school, and Higma school in the Aleppo city. At the same time, the activity of the government troops was concentrated in the area to the south of the city of Hanano. So, the question arises: why does the girl insist on her house was fired and ruined while none of the parties opened fire near her house. It is also unclear why the walls and the furniture in Bana’s room are not affected by the attacks, and always look like new, despite the fact that the girl is constantly complaining that she frequently has to move into a new house. Moreover, the curtains on her photos are always tightly closed and the girl is always clean dressed. On November 22, Bana published a video which showed her walking down the street in a terrorist-controlled district. Very few people are seen in the area. Getting into the shot, some of the occasional pedestrians are trying to get out of sight. They don’t really care for a little girl being shot. At 0.59, a head appears from a corner and immediately disappears. This looks really suspicious. A high quality of the footage, professional editing, and a tripod (the video is really smooth) – all these prove that the video was staged. 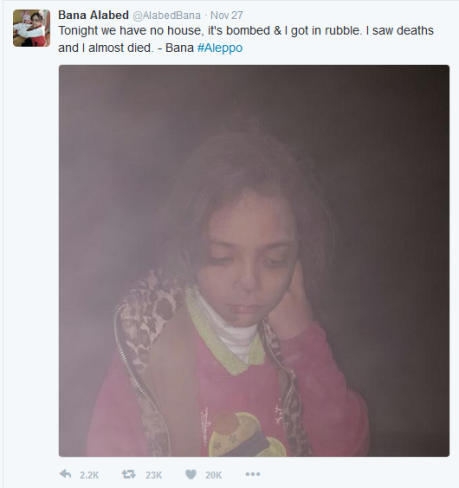 Bana’s tweets are written in English and the girl keeps alleging that Bashar al-Assad “kills children, bombs schools, shells neighborhoods and hurts Aleppo’s residents”. She constantly accuses the Syrian AF of aggressive actions. The little girl’s account is politically straight with massages including popular hashtags. 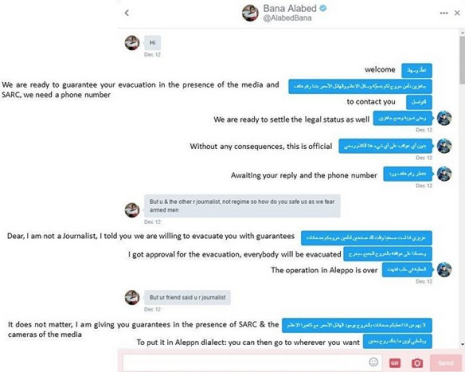 However, in her interview to BBC, Fatima al-Abed stressed that Bana’s twitter wasn’t a propaganda campaign and wasn’t linked to terrorists. Meanwhile, there are a lot of photos not connected to Bana. For instance, the photos of children allegedly killed in the airstrike at an Idlib school. It’s unknown how the footages got into the hands of Bana’s parents, and why the family didn’t want to leave east Aleppo for government-controlled areas if they really were there. Everything becomes clear when you see the Facebook page of Ghassan, the girl’s father, with lots of his friends tied to various radical groups fighting in Syria. Besides, some media reported that Bana’s tweets are written by the popular Syrian opposition blogger Abdel Kafi al-Hamdo (https://twitter.com/Mr_Alhamdo). Creating his account in October, 2016, a teacher and an activist gained as much as 17,000 followers. The propaganda pouring from Bana’s Twitter was mentioned at a high political level. In his interview to the Danish channel TV2, Syrian President Bashar al-Assad stressed that the terrorists and their allies promoted Bana’s tweets. The Hollywood-stylish Bana’s “death” should also be mentioned. First, the girl’s Twitter became inactive just after the government offensive on east Aleppo started. But soon BBC reported that the girl and her mother were alive and that they had come to a safe place. The account was restored and a new Tweet appeared: “Under attack. Nowhere to go, every minute feels like death. Pray for us. Goodbye – Fatemah”. The ban provoked mass hysteria in the social media, the hashtag #whereisBana quickly became trending. At the same time, Bana’s fake accounts started to post messages about her “death”, which were allegedly written by her mother. As of today, it should be noted that the project is still active. “Last tweets” have been repeatedly appearing. Probably, the world will witness other news from Bana, whose messages remind us of the story of “Aleppo’s last hospital”. Till now Bana remains a mystery. The city is completely under government control but no proof of Bana and her mother’s existence in the city has emerged. It is possible that the girl left Aleppo for Idlib alongside the most radical militants (as pointed out by NBC report) or headed to Turkey in the company of other armed groups. The latter suggestion is supported by the call for help directed at Turkish President Recep Erdogan and Foreign Minister Mevlut Cavusoglu that Bana published on Twitter. Locating Bana and showing that she is safe and can start a new, more quiet life, should be of utmost interest for the Syrian authorities. On the other hand, the rumors could be disproved by finding the flat in the eastern quarter of Joured Awwad and proving that exploiting children’s death is nothing but another propaganda plot of the Western media, and that the Bana project is closed, because it seems now it is still alive. Well, the latest news said Bana met Turkey’s President Erdogan. Happy to see that the project is dead. You should say a lot of thanks to Russian-Turkey-Iran’s deal, little Bana!